Lord Carnarvon Guesthouse - Carnarvon Accommodation. Frans Carel Te Water built his beautiful Karoo house in 1886 soon after the corner stone of the Dutch Reformed Church was laid in 1880. In typical Victorian style this house was the biggest in the street and porcelain fittings was used at the doors to enhanced his individual taste. With the officers mess as neighbours during Anglo Boor War some of them were friends with the house second owner Colonel Carel J van Zyl who fought against the Boors and received an OBE from Queen Victoria. Th eccentric van Zyl lived in this house for more than forty years and was the local attorney and mayor of the town and always wearing full military clothing including medals and described by one of the locals as 'very reserved'. By restoring this house we wanted to celebrate the life's of the people that played a role in the history of this house by keeping their legacy alive. 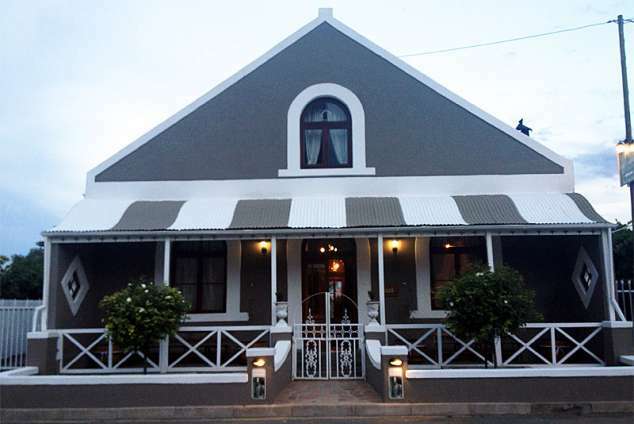 The house has been restored to its former glory , with a mixture of modern facilities and Karoo antiques, and has lots of character and evokes memories of a bygone era of Karoo grandeur. 21 air-conditioned rooms are available, as well as satellite TV, and a communal lounge with a cosy fireplace for cold winter nights and braai facilities outside is available. One bathroom is equipped with a victorian bath and the rest with modern showers. Two of the rooms are separate flats, originally built as communion rooms /(nagmaalkamers) /for use by local farmers, decades ago, on their traditional monthly visit to the town. Traditional Karoo meals on request or meals can be enjoyed at own place of choice in the town. The Carnarvon area is well known for its corbelled houses, build by nomadic sheep farmers almost 200 years ago. A mountain Tortoise Reserve outside the town on the farm where famous Afrikaans author AG Visser grow up can be visited. With KAT project in progress and the possibility of SKA, Carnarvon may play a mayor role in astronomy in the future. Schietfontein outside town, where the first missionary set up his tent is a small settlement where the myth of the water snake is still alive. Lord Carnarvon awaits your stay. 19075 page views since 04 May, 2009. Last updated on 29 Jun, 2018.